I was looking in the fridge the other day and noticed a very sad, depressed looking chicken carcass tucked away on the bottom shelf. There was only one way to make this right, time to take stock in making stock. 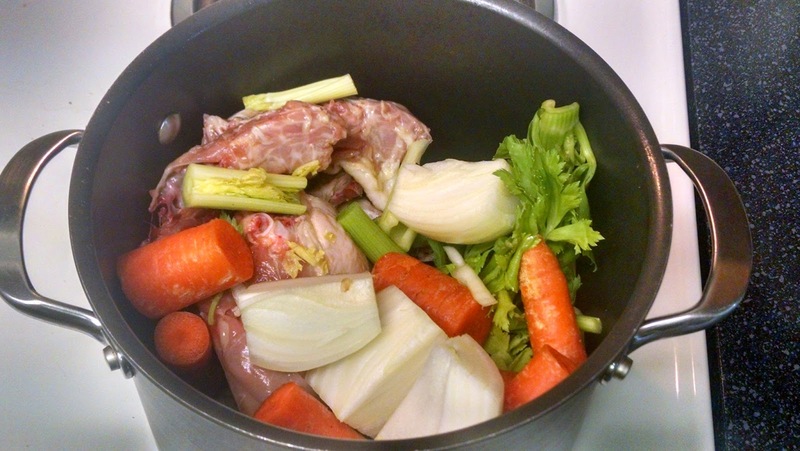 Stock can be used for so many things such as soup, stews. roasts, roasting, and dressings or stuffing applications if you prefer. Not only that, but I believe you get better flavor when its homemade, it is a lot better for you, and it is rather simple to make. The only thing you really need is a little time as making stock can take 4 hours, but most of that time is spent letting this magical concoction bubble and simmer away to get every bit of flavor out of the bones or scraps you can. The application is simple. Throw a bunch of vegetables in a pot with a few seasonings, add the chicken carcass, a few dried herbs, and cover with liquid. Then, bring the cauldron to a boil, reduce to a simmer, and before long you will be left with a flavorful, rich liquid that will add to flavor to any dish or help bring some comfort when fighting a cold or flu. Alright, let’s get after it! Here is the base for any good stock. 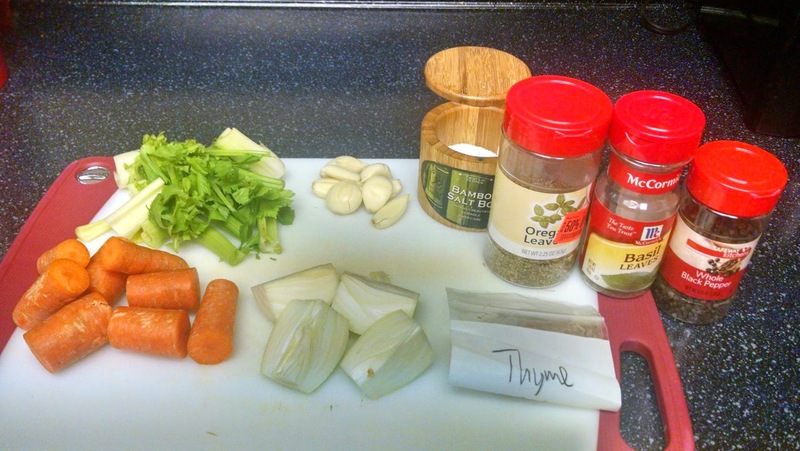 Carrots, onion, celery, peeled garlic, salt, dried basil, dried oregano, dried thyme, and whole peppercorns. For stocks, you want to use dried herbs as opposed to fresh herbs. Why, you ask? Dried herbs stand up better in long, slow cooking applications unless you are using something very hearty like rosemary, which you can apply in either circumstance. So, if you want to use fresh basil or cilantro, for example, finish with those at the last second to get maximum flavor from the herb. Everyone in the pot including 3 tbsp of salt, a couple of teaspoons each of the dried herbs and the whole peppercorns. Oh, why whole peppercorns? We want to draw as much of the flavor out of the peppercorns as we can, so leaving them whole will allow us to do that. If you grind the pepper, you lose all that flavor and you won’t get the maximum affect over a long cook time. We will finish with ground pepper later. 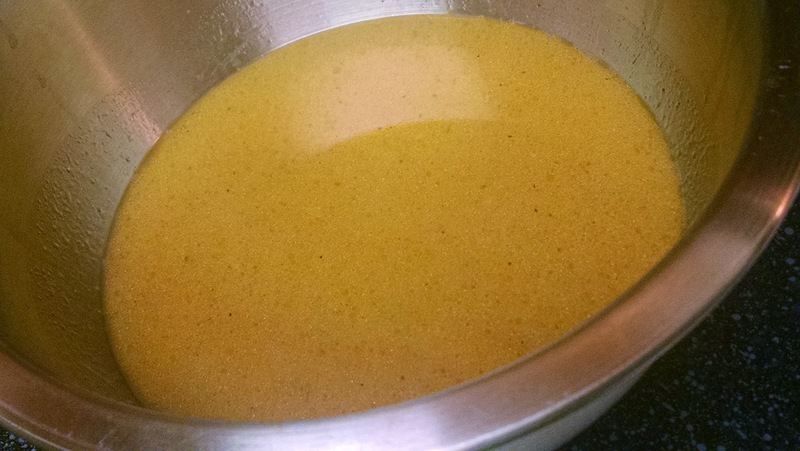 Pour in enough water to cover, you can add a little chicken stock from a can or container if you have some around, but you will get plenty of flavor out of the water if you have seasoned it well. Also, I have tossed in a few chicken backs and necks to help fortify the flavor. You can find these frozen or sometimes fresh from your local butcher. Just ask nicely and you will probably get what you need. Bring your stockpot, I think mine is about 6 quarts, to a boil and reduce to a gentle simmer. Okay, now comes the painstaking and easy part. Just stir the stock every 15 to 20 minutes and let the mixture reduce. 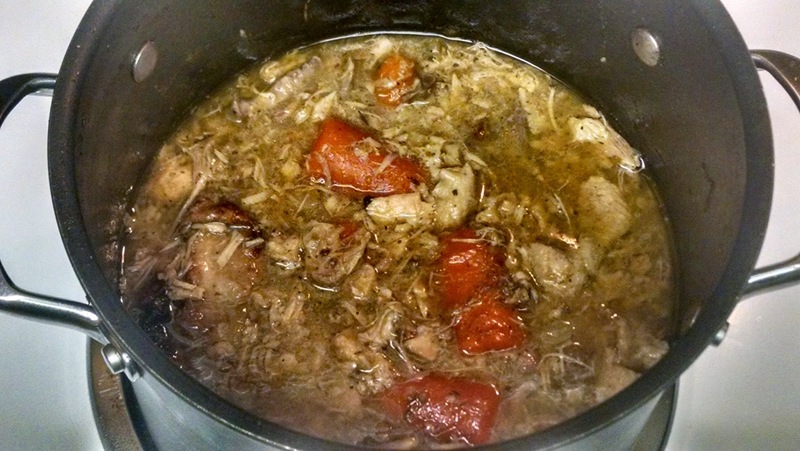 This can take between 3-4 hours, but you will start to notice the stock start to take on color and characteristics of a proper chicken stock. Here is a photo below for you. After that time and a few sample spoonfuls to test the flavor, you should get something that looks like this. Finally, you will want to strain the stock so you get a clear liquid. You only have two things to do after that, skim the fat that will settle at the top after it cools. I would recommend putting the stock in the fridge overnight and skimming off the fat in the morning. 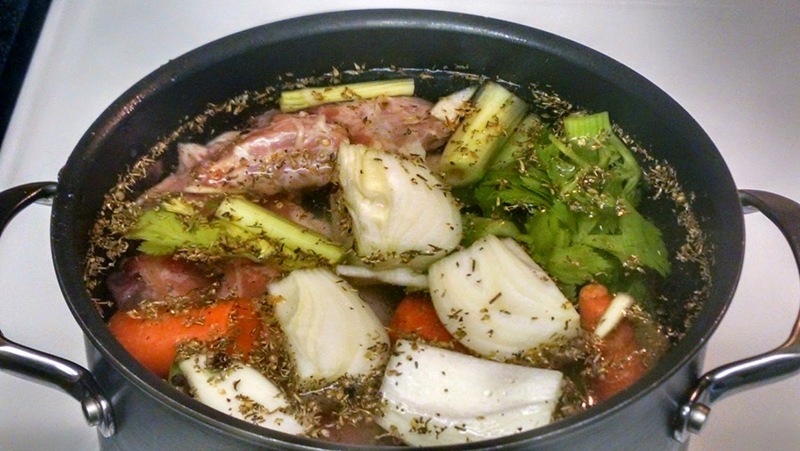 Second, check the seasoning as the stock may need a bit more salt or fresh ground pepper. Lastly, if you notice that your stock looks like your favorite childhood jell-o like treat, don’t worry. This is totally natural and happens with homemade stock as the gelatin in the bones and cartilage will cause the the stock to look that way. Simply reheating will bring the stock back to it’s usual form. Ideally you should have something that looks like this. 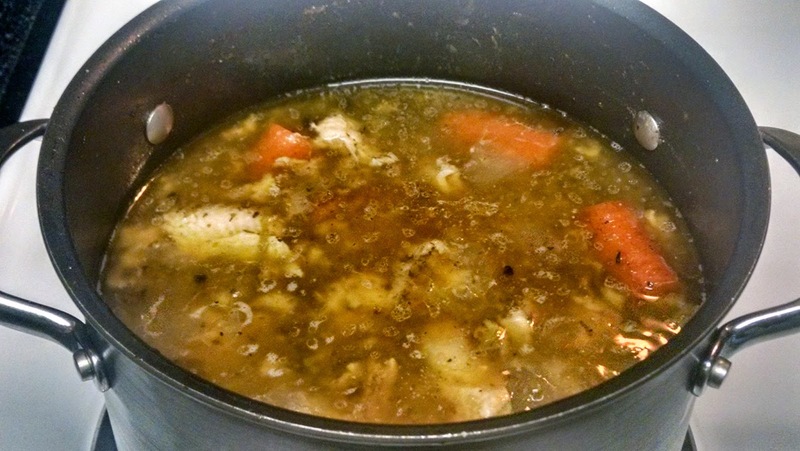 By the way, the base ingredients I mentioned at the beginning of this post can be used for a vegetable stock, you can add leeks or other vegetables instead of chicken. Alright, just wanted to do a quick follow up so you can get a sense of what the heck this stock will be like after cooling overnight in the fridge. Make sure to use a spoon to discard as much of the fat that has risen to the surface as possible. You will see a distinct change in color when you get to the stock layer. Remember, this will look different than any store bought stock because it will look like jello. However, as I said before, the appearance is totally normal. If you still aren’t sure, just reheat a couple of tablespoons of broth in the microwave for 20 seconds and all will be right in the world of homemade chicken stock.